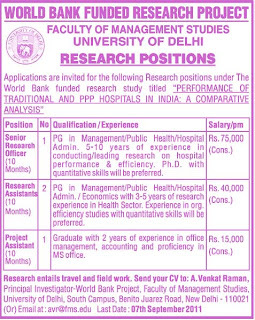 Applications are invited for the following Research positions under The World Bank funded research study titled "Performance of traditional and PPP hospitals in India: a comparative analysis"
PG in Management/Public Health/Hospital Admin. 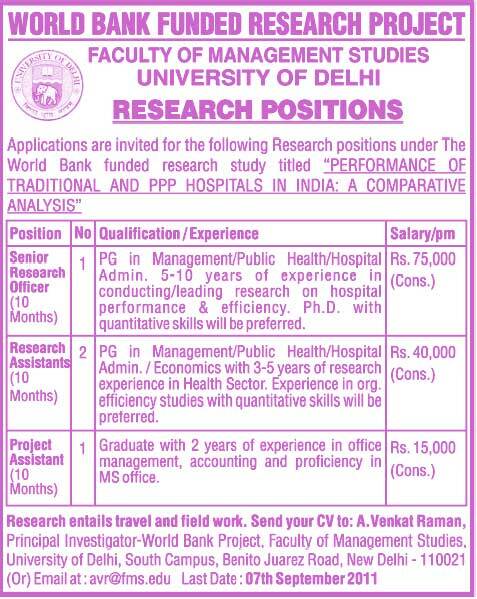 5-10 years of experience in conducting/leading research on hospital performance & efficiency. Ph.D. with quantitative skills will be preferred. PG in Management/Public Health/Hospital Admin. / Economics with 3-5 years of research experience in Health Sector. Experience in org. efficiency studies with quantitative skills will be preferred. Graduate with 2 years of experience in office management, accounting and proficiency in MS office.